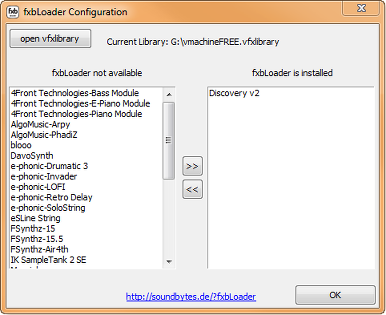 The fxbLoader allows to load vst preset banks within the V-Machine and the VFX host software that do not offer this functionality. If you find this software useful feel free to throw a few coins into my hat. In case you can't get near enough to my place you can always donate to my paypal account paypal@soundbytes.de. This configuration utility is used to add or remove the fxbLoader to or from any plugin in a chosen VFX-Library. 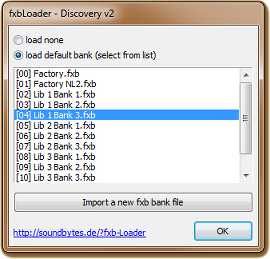 Once the fxbLoader has been added to a plugin it will load a preselected fxb preset bank into the plugin as soon as the plugin is opened in the V-Machine or the VFX VST host software.